Checkout this Rare ‘Go Mango’ 1970 Dodge Charger 440 Six-Pack Barnfind found in barn after owner passed away. Better keep your eyes peeled, because you never know what your next-door neighbor is putting away that wants to remain hidden. Sometimes it’s not a bad thing! A Pennsylvania car enthusiast who’d rented a home in a forest neighborhood near Harrisburg last year had no idea that the man next door had over 80 cars in a collection until he died two months later. 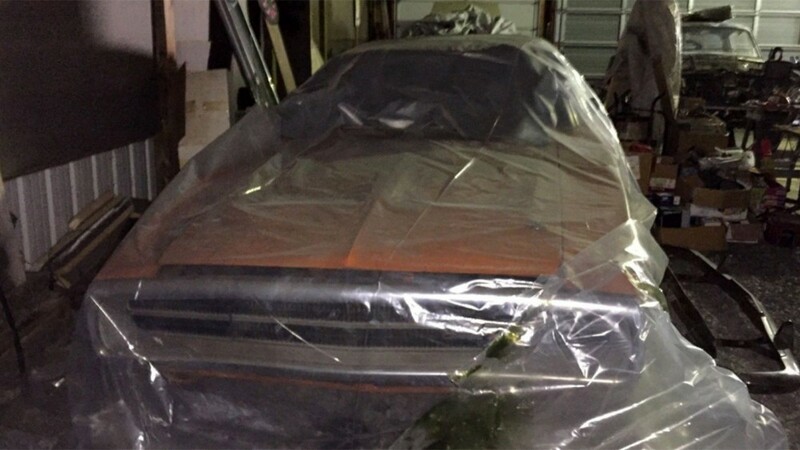 The muscle car fan found quite a few collectibles, but none better than a 1970 Dodge Charger R/T painted ‘Go Mango’ that was hidden under a plastic sheet in a hidden barn and that he wasted no time buying from the estate. It had been parked there for many years and was last moved outside when the barn’s roof was damaged during a storm in 1993. The coupe was originally equipped with a 440 cubic-inch “six-pack” V8, but the owner had a habit of swapping parts among his cars and the numbers-matching engine for this one was found in the basement. The car received several custom workmanship done over the years, but most of the original parts were still with it, save for the carburetors, which had been stolen many years ago. The 1970 Dodge Charger Registry says there were only 431 R/Ts painted ‘Go Mango’ in 1970, and just 22 of them had a 4-speed manual transmission like this one, making the find even more amazing. With quite a bit of rust and a worn interior, it’s far from being excellent, but the engine is back in and running again, the metal appears straight and the experts at BarnFinds.com think it wouldn’t take too much time and work to get it back into top condition. Our opinion is that the market thinks it’s worth plenty as is. The car is being sold on eBay auction and the bidding has already reached $45,000, which is still short of the non-disclosed reserve price, not to mention the Hagerty Price Guide’s $108,000 value for a fully restored example. UPDATE: This vehicle did not sell. Final bid was $46,669.69.